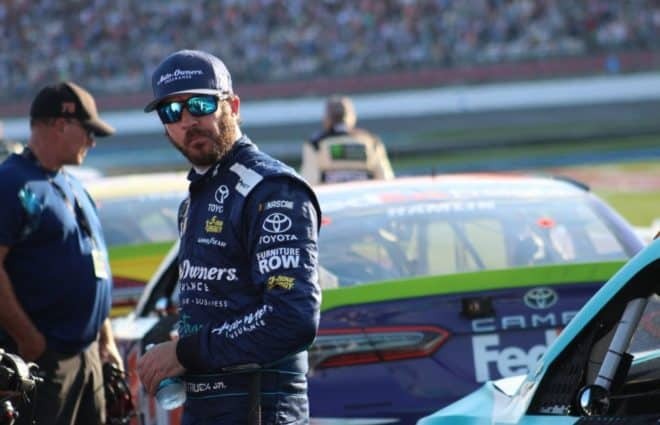 Martin Truex Jr.‘s quest to defend his Monster Energy NASCAR Cup Series title faces a setback today (Oct. 28) at Martinsville Speedway. The 2017 champion failed post-qualifying inspection and will forfeit his sixth place starting spot for the First Data 500. Truex will start the race in 33rd instead. Nine-time Martinsville winner Jimmie Johnson also failed NASCAR inspection. Johnson is trying to end his career-long 55-race winless streak and continue his streak of winning at least one race for 16 consecutive seasons. Both men have struggled of late in the postseason. Johnson, knocked out after the first round, hit the wall late at Kansas Speedway while Truex struggled before ultimately putting together a top-10 effort to pull through. David Ragan, Jeb Burton, JJ Yeley and Timmy Hill also failed inspection. Ragan and Hill failed twice, resulting in the ejection of both of their car chiefs. All of the teams failed for not meeting the requirements of NASCAR’s mechanical measurements. It’ll be a large group out back as Brad Keselowski, Darrell Wallace Jr. and Paul Menard will also start from the rear. Keselowski’s team made unapproved adjustments, Wallace is going to a backup car after wrecking in qualifying and Menard’s team changed an engine after qualifying 39th. Kick out all the cars that failed. That would send a message that might get results. The event will be better for it with fewer cars.